A Interim Group Management Report 5 Executive Summary 12 Property-Casualty Insurance Operations 22 Life/Health Insurance Operations 28 Asset Management 32 Corporate and Other 35 Outlook 37 Balance Sheet Review 44 Reconciliations Interim Report Third Quarter and First Nine Months of 2014 Allianz Group 15 Despite the current economic environment the operating investment income (net) increased to € 770 MN, a rise of € 52 mn. This was mainly driven by a better foreign currency result net of hedges. Interest and similar income (net of interest expenses) remained stable, as the lower income on debt securities was compensated for by increased income on equities. The average asset base1 grew by 2.3 % - from € 102.5 BN in the third quarter of 2013 to € 104.9 BN in the same period of 2014. Operating income from financial assets and liabilities carried at fair value through income (net) increased by € 39 mn to a profit of € 4 mn. This was largely because of a positive development in the for- eign currency result net of hedges. Operating realized gains and losses (net) grew by € 60 mn to € 74 mn mainly driven by higher realizations on equities in the third quarter of 2014 compared to the previous year’s figure. Expenses for premium refunds (net) increased by € 45 mn to € 93 mn due to a higher policyholder participation, mainly from the higher realized gains attributable to our APR (accident insurance with premium refunds) business. Other result € mn three months ended 30 September nine months ended 30 September 2014 2013 2014 2013 Fee and commission income 347 317 955 915 Other income 7 11 46 29 Fee and commission expenses (323) (295) (894) (843) Other expenses (24) (6) (38) (18) Restructuring charges (5) (11) (6) (13) Other result 2 16 64 70 2014 to 2013 first Nine Months comparison Operating profit rose by € 524 MN to € 4,257 MN. This improvement was driven by the favorable development of our underwriting result. The operatinginvestmentincome(net)increasedby€ 57 MNto€ 2,323 MN. Our combined ratio improved by 1.4 percentage points to 93.6 % benefiting from a 2.3 percentage points lower accident year loss ratio. This favorable development was largely due to 2.7 percentage points lower losses from natural catastrophes and a better underlying claims development, which more than offset a higher impact from single large claims. We recorded a 1.0 percentage point lower contri- bution from run-off. The improvement in the combined ratio was further supported by a lower expense ratio. 1 Including French health business, excluding fair value option and trading. 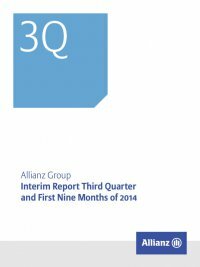 Net income 2014 to 2013 third quarter comparison Net income increased by € 287 Mn to € 1,083 MN and was driven by a higher underwriting result reflecting the absence of natural catastro- phe events and an improved investment result. A rise in the non- operating profit by € 161 MN to € 86 MN, contributed to this favorable result. 2014 to 2013 first Nine Months comparison Net income decreased by € 117 MN to € 2,697 MN compared to the previ- ous year. The higher operating profit was offset by a one-off effect from the inter-segment pension revaluation2 recorded in the first quarter of 2014. 2 For further information on the one-off effect from pension revaluation, please refer to note 4 to the condensed consolidated interim financial statements.